+ Move "Portal 01,Portal 02,Portal 03,Portal 04" to Close BigStone in Town. + Move "Portal 01" to Close Witch in Town. + Info: Less Walking in Town in Multi Player & Singel Player. fix Mana_Shield bug for all Release re uploaded all version again. 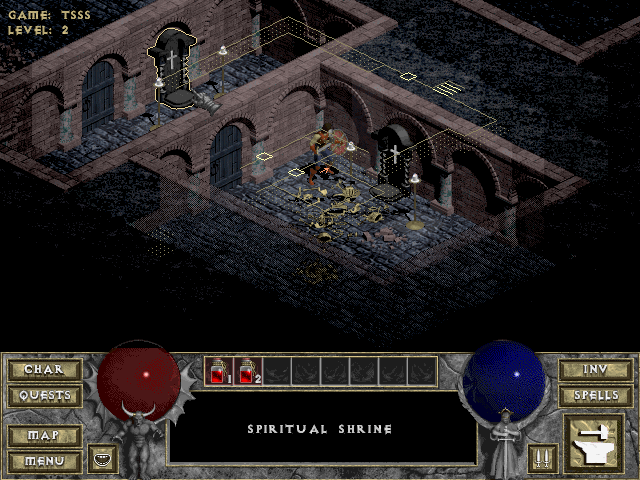 Spiritual || Fills all empty inventory slots with small amounts of gold. Stone || Recharges all staves equipped and in inventory. + Info: Less Click on Shrine and get cursed by it. + Remove (9) "Bad" Shrine from MultiPlayer and then put them in SingelPlayer. (-1) to all stats of the other players in the game. KDG-D1HF ChangesLog "Release Version's" for V010 To V012. Info: "no Permented bad effects" + Remove Bad 9 Shrine From MP and then put them in SP: + little bug fixes + Mana Shield Bug fix all Release. Release_Changes_0.12: + Move Portal 02-04 Close to Stone in Town and to Portal 01. + Info "Less Walking in Town" + Move "Portal 01" to Close Witch in middle of Town. my bad, i used the version 1.00 of hellfire. after patching everything works perfect. plus i had to patch the hacked hellfrui in order to get the multiplayer option, i thought i already had the patched one, but i just used the hellfire version 1.00, so the multiplayer was visible even i didnt had the hacked hellfrui.dll. ive done all the steps, the game works just fine. starting without mod, i get the menu multiplayer. if i start the game via the KDG-D1HF-030, then ill get back to the old menu and i cant start multiplayer games. do you know the problem? KDG-D1HF has not been tagged yet.